On October 19th CCP has unveiled their second mobile game coming to iOS and Android in 2019 - EVE: Echoes. The name of the upcoming title was known two days prior to EVE Vegas thanks to some smart EVE players, who found out that CCP has registered the trademark for Echoes, but it was unknown at this time for which game this new name will be used. EVE: Echoes (formerly known as Project Galaxy) is supposed to be a scaled down version of actual EVE Online, with all core gameplay elements intact. The game promises an "authentic EVE Online experience for mobile devices". According to the Apple Keynote earlier this year, the game will also feature AR capabilties on compatible Apple devices. It isn't easy to port a game as big and as broad as EVE Online into mobile world, but if CCP and NetEase stuck to the core gameplay elements, it should be possible. I was rambling about a mobile game in New Eden at least since 2013, which was the first time I had to cut back on my PC gaming. Then in 2014 I started playing World of Tanks Blitz, which is an awesome mobile game, ideally fitting those short bursts of free time you have when waiting for something, be it a doc appointment or during your daily commute. Mobile devices at the time already had enough juice (i nterms of GPU power) to run original EVE from 2003. EVE: Echoes will feature an expansive map with thousands of star systems (judging by the video shown at EVE Vegas it seems to be a copy of the New Eden cluster from EVE Online, at least system names look familiar). Core gameplay elements such as exploration, combat, mining and trading are said to now fit inside your pocket. Players will be able to form corporations and wage wars over territories just like in it's bigger brother. Developers even expect the same huge fleet battles happening from time to time. From the technical side, the game will be running on NetEase's proprietary engine called NeoX (why not Unreal 4? CCP has recently chosen to use Unreal Engine for all their upcoming projects). EVE: Echoes will be released on iOS and Android in 2019, but no information about minimum requirements regarding CPU/GPU or screen size have been announced yet. From Apple perspective, AR mode will require at least an iPad Pro or iPhone 6s. 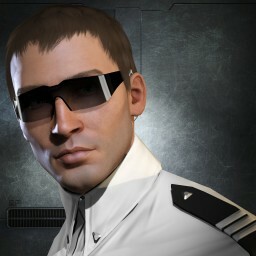 I hope it will be possible to link EVE: Echoes to EVE Online in some way, namely use the same name and avatar we had for EVE Online. It would be awesome if the game was eventually released for touch-enabled x86/x64 devices like Microsoft Surface or my Asus Transformer 2 in 1 tablet.